Even though I’ve been away from home, I have still managed to get in lots of sweet yoga time. Chair yoga is often called ‘Seniors Yoga’, although of course it isn’t just for one age group at all. I asked Gramma if she’d like to join me in a yoga class, and together we did a full pranayama (breathing), asana (poses) and hand mudra practice, with myself leading the class. I had written down all the poses we do from videos Michelle (my yoga instructor) and I created during our classes. 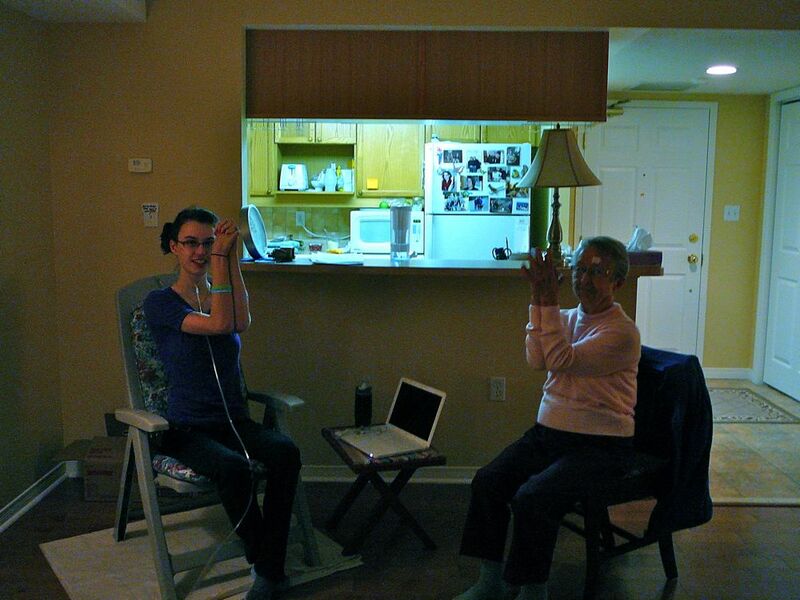 The video of us doing yoga was a bit quiet for Gramma, so I led us through the practice. I was tricky at first, trying to speak calmly and remember to remind others about posture and when to breath and stuff, but it was very rewarding. I think I’d like teaching yoga very much. shoulder series with the dynamic duo! We are in Toronto, to see my Lyme doctor who is going to the ILADS conference, and the rest of my family, who live in this general area. I am so drained after the flight. Toronto is HUGE, and I am feeling very small-town right now. I miss being able to look at the top of buildings without craning my neck all the way back. The flight went well enough, although the altitude always makes me feel very sick. I have a killer sore throat and am having trouble swallowing. Nothing a little oregano oil won’t nab, but this is an all-time quickest infection rate. I missed choir practice last night as I was feeling so low and my throat was in so much pain. 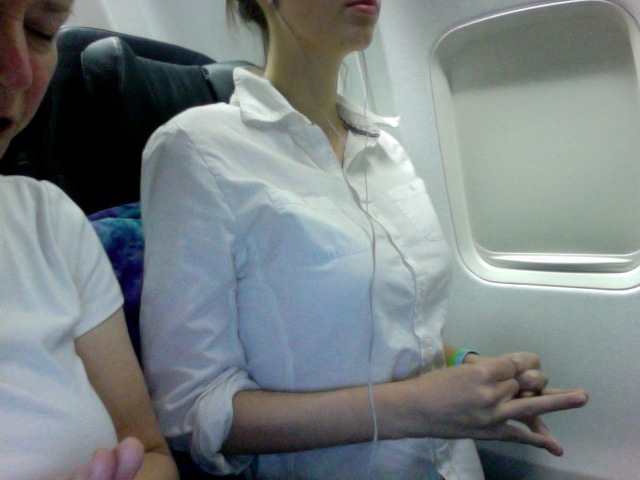 The benefits of sitting in the bulk head on the lovely WestJet were felt as soon as Mum and I started doing yoga. Because the computer was with us, we could do a full asana practice, and it was like the lovely Michelle was with us too! Made the flight that much quicker and more peaceful. After seeing how much I enjoyed yoga, and the benefits I had from it, Mum decided to start doing the practice with me. We did a full practice yesterday, which was fun to do together…girl time! Before the afternoon yoga practice I was feeling rather restless and couldn’t settle to any activity, and was fatigued and exasperated, which seemed like a good time to bust out some yoga moves. I felt energized afterwards, which made my day so much better. Hopefully we will be able to practice ever single day of the week, 3 times with teachers, and 4 on our own. Won’t that be fun! this ball won’t run away from me! After what felt like weeks of spinning (really about 2.5 weeks in all in all), I finished the incredible batt of mohair/wool fiber that dear Arleigh sent me, dyed by a friend of hers, Leola! What is more, I set it warm water (to make sure it wouldn’t twist back on itself! ), stretched it for awhile (as it was super dee duper curly!) and today finally put yarn loops on the back of a chair and then proceeded to put the yarn into a ball. Wow that was a lot of work! 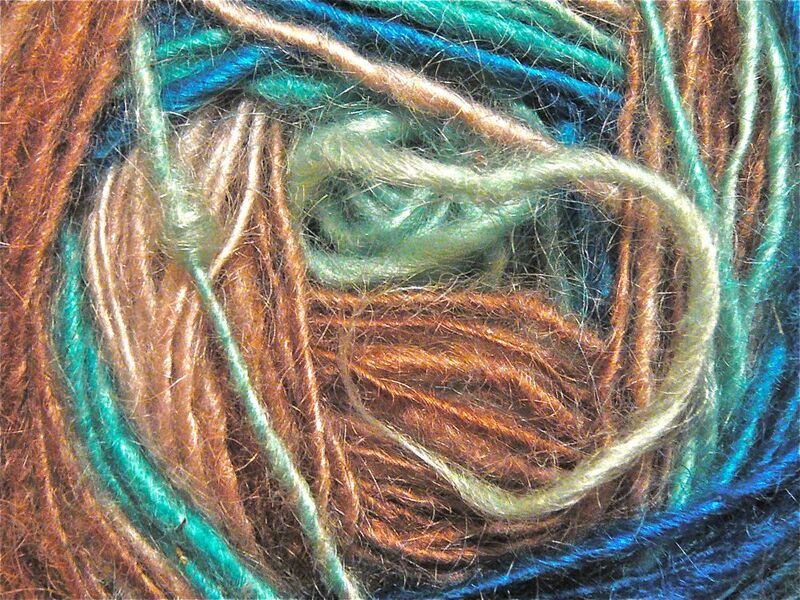 Sheer the animal, wash the fiber, pick and card the individual fibers, dye the fibers, spin the fiber, set the fibers, and ball. I only had to do 3 of those things. Imagine if you followed the process start to finish. How rewarding! I am very pleased with how it turned off…for singles (meaning only one strand, versus many strands making up a thicker yarn) it is very evenly spun (meaning that it is almost all the same thickness!). I have no idea what it’s going to look like knit up, so I just can’t to figure out what I can make with it and cast off! Unlike a lot of mohair yarns, this one is very soft and dreamy, which has mostly to do with the animal and perhaps from where on the body it was harvested. It is mixed with sheep wool too, which would help add softness. The yarn has a wonderful sheen to it, and it almost sparkles in the light. 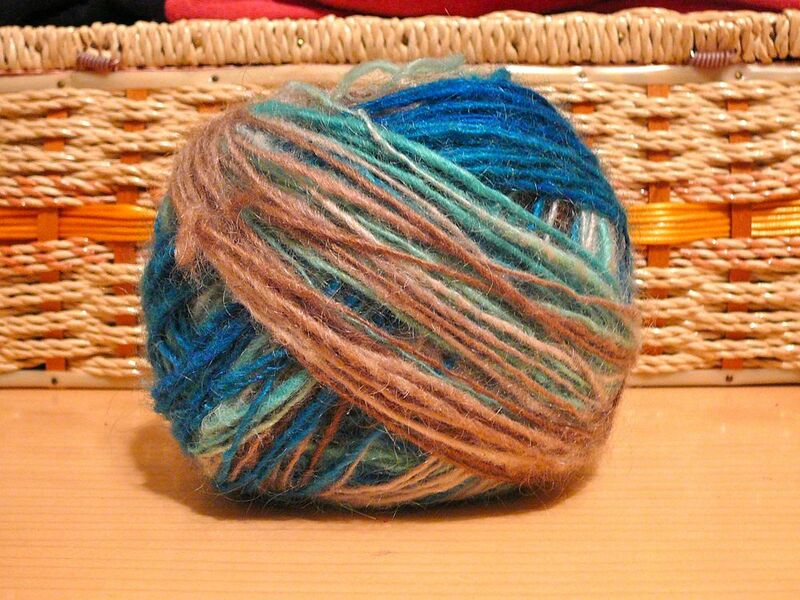 Spinning handspun yarn is supposed to be one of the most enjoyable experience out there for a knitter. I can’t wait to report back all the wonderful bonuses of knitting with your own yarn. All that treadling and sweating paid off enormously, and I feel very proud of myself. I feel that in the coming weeks/months I might have to ease back on the amount of spinning I’m doing per week, because the IV meds exhaust me. I am already noticing icky affects from the medication. The most annoying being that I am very tired and lethargic, and that my mouth tastes of rubber bands and deceased mice all the time. Because IV meds enter through the bloodstream, and because my dosage is so high, I can taste the medicine through the tiny spider webbed blood vessels in my tongue and nasal passage. It would be much more fascinating if it wasn’t my own mouth. These vessels are very close to the surface in this area…maybe that’s why it can be tasted? I wonder if anyone else has noticed this while taking Clindamycin? I did a bit of research about it and a lot of people mentioned a bitter taste. This seems a bit non-specific to me, because for me it so very clearly tastes like rubber bands…as though I have been chewing on them in place of gum. My naturopath said that people who can taste the saline and heparin flushes (done before and after IV) have trouble detoxing. I found this an interesting principle and wonder if it also applies to the medicine, or maybe it’s just caused from a side effect. Yesterday when I had yoga class with Barbara, I had to take lots of breaks because I was so exhausted. Bringing my arms and legs up made me feel so weak and faint, something I haven’t been complaining about in previous weeks. I was so exhausted after the practice, rather than feeling energized. This is disappointing and frustrating, but hopefully as my body becomes more adjusted to the rhythms of the medication this will improve? It will be interesting to see what happens when I am off the IV meds for 3 days (we ‘pulse’ 2 weeks on, 3 days off). The zombie finally got to sleep! My new record is four straights nights without sleep. Does anyone else remember that House episode where this girl doesn’t sleep for almost a week, which is apparently the longest you can go without sleep before dying? Maybe that episode was a bit hysterical…but don’t worry, I wasn’t worried about this. I was just damn frustrated that I could meditate all night and not fall asleep. I slept fitfully, and for just a couple of hours, but still, I feel a wee bit more human today. Just as well, because I was starting to have a strong desire to hunt down humans, and kill and eat them. (hold on…that was a continuation of the zombie reference. work with me here. zombies eat ppl right? or is that vampires? oh lord…who cares?). Last night was the first official practice of the Linden singers. It’s been really hot here, so upstairs in the First Met church was sweltering, even in the late evening. There was a meeting…I didn’t really understand what was going on because it was so formal. I took notes tho :). The people are all so lovely, despite our age gap. I’ve always gotten on very well with adults, even as a young child, so it didn’t seem strange to me. Hopefully I can recruit some more young people for next year…that would be nice. I am singing soprano. Oh yes, you read that right. I feel like a mouse being pinched every time I hit a note an octave about middle C. It’s not a pretty sound, but it is a sound noise none the less. I used to sing alto/tenor in school choir (mostly to make up for the lack of boys). Linden has oodles of tenors and basses…it’s such a novel sound for me! I listened to the radio interview my mum and I gave the other day at CBC. The radio show is called “On the Island”, a morning favorite. Check out Sept 7th program, “Living with cougars, honouring Campbell, Lyme Liberation treatment and memorial trees“, to listen to our interview. We used to listen to a bit of CBC in the morning rides into school, and I recognize Gregor Craigie’s voice! Very tranquil. Another opportunity to spread the word about Lyme disease, and the Liberation therapy…hopefully this knowledge can help others. I also created a chair yoga blog today, called “8 Limbs, 1 Chair“, which will document my healing journey through yoga. I am very excited about this! Michelle encouraged me to reflect on my learning journey, and what a great thing to share with fellow Lymies, and people in wheelchairs! Hopefully I can inspire others to try it…who knows, it could make all the difference in your health! Who would have thought a few months ago, that now, half way through August of my 3rd year in a wheelchair, I’d be doing yoga? Certainly this beats physio (sorry cuz Jenn, but it gets really dull). Why would you want to wiggle you toes and lift your arms in an uninspired and strictly medical activity, when you could be relaxing and working those tired muscles in yoga? Yes, exactly what I realized. I saw a very nice physiotherapist from QA (Queen Alexandra Foundation), offered to us through my SIDES schooling. Positive and helpful experience. But I was so bored by the exercises, which were maddeningly dull for a girl who loved to run in the forest and play beach volley ball. Also, for some reason, it was difficult for the physioterrorist ( teeheehee) to grasp that trying to help me by touching me only made things worse. The result was painful lessons. My legs have been steadily getting stronger since the Liberation therapy. It’s amazing the renewed confidence one can have in walking, when you can feel your legs. It is scary to try to walk when you have no idea what the lower half of your body is doing. I’m less shaky when I try to stand, and can walk about the same distance, but with renewed confidence. High heels here I come. So Mum and I were discussing what I could do to further strengthen my legs, and in a stroke of inspiration I thought of ‘chair yoga’. As soon as I said it, two thoughts were running through my head. “What am I getting myself into?” right after “Saying this aloud probably means I can do the yoga”. I loved doing yoga before I was ill. Stretching your limbs in ways you never expected, or don’t usually do, leaves you with a feeling of overall relaxation and strength. I started searching to see if anyone taught chair yoga in Victoria. We are the city of the ‘newly weds, the nearly dead’s and the flower beds’. I found a few people who used to or do teach chair yoga (at seniors homes), but it didn’t work out. I thought I would have to ask someone in the conventional mat yoga sector to teach me, when I happened to discover Michelle. She taught a teachers chair yoga class several years ago. I figured I was pushing my luck to expect her to be willing to teach a near novice student years after the fact but went ahead and emailed anyways. Boy am I glad I did. The stars really aligned on this mission. I had my first lesson this afternoon. I was a little apprehensive, wondering if she would be able to help me while understanding all of my complications (pain and memory being the most important ones). Unfortunately – or, oddly enough, fortunately- Michelle too has suffered several of the health problems I have (including insomnia). She was introduced to meditation at 8 to combat her own insomnia, which worked wonders for her, leading her to become a teacher of the traditional 8 limbs of yoga. That was over 27 years ago. We connected right off, and shortly after meeting, I knew that Michelle could really help me, and I trusted her to work with me. Her caring, warm spirit instill in me the confidence to push myself, to try to let my body heal through yoga. The exercises we did for 30 minutes weren’t strenuous, if anything, it felt wonderful to use the muscles I had neglected, due in part to fear of pain and partly to weakness and lack of control. Breathing (pranayama) is essential in yoga, and I am very excited about this, because my lungs are so weak. After the various movements practiced together (in office chairs), we did a 10 minute guided meditation, called a yoga ‘nidra’ (nidra meaning sleep). Wikipedia describes it as the “conscious awareness of the deep sleep state“. I gathered that the purpose was to empty all thoughts, and to fully relax the body. For someone who is always fidgety, it was such a relief to just sit still, empty my mind of all thoughts, and just be. Bliss. Michelle, and two other of her colleges from her studio, are going to come to my house 3 times a week to practice chair yoga with me!!! I am so excited. I literally am counting the days until Monday, when we meet again. Michelle has some online videos of various yoga poses, some seated, that I can practice at home in the meantime. They are all being so generous with their time and energy. It is amazing the kindness of people that I have only just met/haven’t even met yet! I was just blown away. I am so grateful for this opportunity to heal with yoga :), and especially to be working with such incredible people!